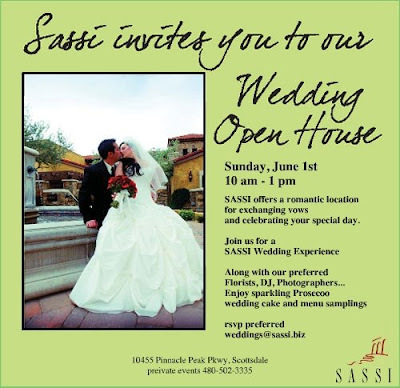 Sassi is having an open house Sunday June 1st from 10am to 1pm. Check out this awesome venue, it may be exactly what you are looking for for your wedding day. One of the places that you can use for your ceremony or reception is Sassi's outdoor garden lawn area. They also have a private event room with two fireplaces, wood beam ceilings, an intimate foyer, and private chambers for the bride. The private event room includes a covered patio overlooking the courtyard with views of Pinnacle Peak. The Sassi garden lawn and private event room accommodate up to 150 guests. At Sassi, the overall atmosphere was handcrafted to provide the ideal location for rehearsal dinners and weddings. For more infomation contact Krista Bossie or Bernice Hertzfeldt, Director of Sales at 480-502-3335, bernice@sassi.biz.